Lockheed Martin Corp.'s Orlando Missiles and Fire Control division plans to launch this summer its first major expansion in decades, adding a new office and research building to its Sand Lake Road campus. The new building is part of a proposed, $100 million project that would sweep away an assortment of temporary structures that the giant defense contractor has erected over two decades to accommodate a growing number of engineers. The company said construction would begin after it obtains needed permits. Lockheed's proposed expansion comes amid increased Pentagon demand for high-tech weapons and guidance systems. As orders increased, the Missiles and Fire Control division added jobs, streamlined and modernized its production plant, and now plans to add space. The 250,000-square-foot, six-story building would also provide workspace for MEADS International, a joint venture that includes Lockheed. MEADS, an acronym for Medium Extended Air Defense System, is developing a replacement for the Patriot and Nike Hercules guided missiles. Its 200 employees now work in temporary buildings in the Lockheed compound. Looks like a new Theme Park for Kissimmee area, eh? 450 acre parcel to build Paidia's DestiNations Themed Resort, a 1,000-unit condominium and fractional resort with nearly 200,000 square feet fo retail space and a 140-acre theme park. Have not purchased awaiting Oceola approvals. Sounds a bit like Epcot with lands for Egypt, Thailand, Peru, Russia and New Zealand (odd mix). Groundbreaking spring 06, grandopenning late 07. If Splendid China is any example, DestiNation is destined for failure. Is Kissimmee area getting another theme park? Details still murky on development plans for 450-acre parcel west of city. KISSIMMEE -- Investors are eyeing a 430-acre parcel west of Kissimmee, once planned for the Vedaland Theme Park, to build Paidia's DestiNations Themed Resort, a 1,000-unit condominium and fractional resort with nearly 200,000 square feet of retail space and a 140-acre theme park. Standing in a field between the Lockheed Martin Co. plant and Orange County's new convention center annex, developer Marc Watson is laying out his vision for the 1,800 acres around him. He sees 5,400 hotel rooms, 6,200 condos and time-shares, 2.2 million square feet of upscale shopping and a water resort, all in a setting ringed by horse pastures, a citrus grove, lakes and cypress-tree wetlands. Its name: Universal Boulevard Orlando. To Watson, the future of the International Drive corridor lies on Universal Boulevard. Okay, it's your money. Why would you want to renovate a rotting sector when you can build something new and spectacular in a better accessed area ? 1) Because you still have to deal with a rotting sector of abandoned and delapidated buildings and a bunch of asphalt you left behind. Not only will it look like crap (even worse than today) but it will breed crime that I will have to pay for more police and or sherrif patrol. And you have no problem with this? By this logic downtown Orlando shouldn't put new condos where old abandoned buildings stood, but rather just leave the old downtown to rot and try to start a new downtown elsewhere. Hey, this gives Parramore room to grow. Maybe Parramore should be abandoned too and we could clear some land and see who we could get to move there. We would also have a big rat-infested, crime-ridden CBD to be proud of. It is my money and I wouldn't want to support a policy where whenever something gets old, you just move on, leaving a trail of asphalt and abandoned buildings in the wake. I see why you are such a Crotty fan. Oh, come on. That's just schoolyard taunting (with fine hyperbole, too boot). And didn't you giggle like a schoolgirl when Cameron Kuhn (not really real money) and tore down those historic buildings ? National real estate company Empyrean Holdings Inc. announced Thursday that it has committed to a $70 million real estate development in Orlando. Company officials declined to disclose the property's location, but did say they are confident the property will be used for time share condos because it is located within a half-mile of a large theme park. In addition, officials say they anticipate selling a large amount of the time shares to the European market because of very favorable exchange rates and Florida's entertainment value. "We feel that we have found a significantly undervalued property," says Robert L. Lee, CEO of Empyrean, in a release. He adds that Empyrean anticipates the project will self-capitalize much of the development costs, lowering financial pressure on the company and making it a very profitable project. ORLANDO, Fla. - SeaWorld Orlando has released some details on a proposed expansion that would be a "naturalistic" park that will have animal encounters. SeaWorld officials said one of the park's signature elements would be an attraction that would swoosh swimsuit-clad visitors down clear acrylic flumes amid a lagoon of jumping dolphins. 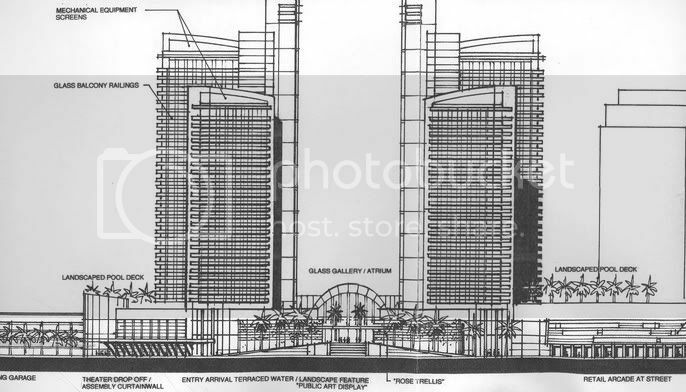 New huge condo-tel development proposed for Universal Blvd and Carrier Drive's southeast corner. South of the proposed Point Orlando shown on the first page of this thread. Besides the towers you see here, you'll notice the one in the background to the right. The bustling business-tourist corridor near the Orange County Convention Center will get a boost in luxury hotel rooms if plans for a new upscale brand come through. Representatives of an Atlanta-based hotel company run by the former president of Ritz-Carlton said Thursday that it will open and manage a 300-room luxury hotel in south Orlando in 2008. The Solis Resort & Spa will be built near the convention center and will be one of six hotels to open under the new Solis brand, representatives of the West Paces Hotel Group LLC said Thursday. West Paces is headed by Horst Schulze, former Ritz-Carlton president, and is bankrolled in part by former Coca-Cola Chief Executive Officer Douglas Ivester. Convention Center Executive Director Tom Ackert said he had no details about the project but liked the concept. However, Ackert said past projects have been announced and "no dirt turned," so convention center officials "look with some skepticism" at all announcements of proposed upscale projects in the area. Other Solis Resorts & Spa's will be in Phoenix, Atlanta, San Antonio, Chicago, and Frankfurt (Germany). There's an article in the OBJ this week stating that a developer will demo the Mercado and create a Bellagio type twin 35 story tower hotels by 2008. It inlcudes a $5 million fountain show at front and possibly a cirque de soleil type show as well. Looks very impressive. I am on the road and can't post the rendering yet. I saw that. And I'd guess that 35 stories, with ornamental tops, could be 400 ft. or more. In any case, quite an impact on the I-Drive area. Developer envisions convention area resort with Vegas-style rooms, retail, restaurants. ORLANDO -- Unicorp National Developments Inc. is planning the next generation of Orlando vacation resorts, a $1.5 billion Mediterranean- and water-themed complex called Aqua. Potential competitors to the new I-Drive resort project view the news of the 2,1000-room Aqua condo hotel -- set to open in 2008 -- as a mixed blessing. For the record, the Unicorp people who are developing the Bellagio-inspired Aqua are also developing the Bellagio-inspired Dellagio less than 2 miles away on Sand Lake Road. Think they might just be a little too obsessed with a certain Las Vegas hotel? A 10 story waterfall? thats sounds pretty cool, reminds me of the waterwall at the medical center and transco tower in Houston. Drivers are going to get some relief on Sand Lake Road and the southern entrance to Orlando International Airport from the new federal highway bill approved by Congress last week. Hey bic, in that article, they list the Peabody expansion as still being 1,000 rooms. That was the old 42 story tower's number of rooms. Also, Rosen also scoffed at the Carlson 3,500 room proposal back a few years ago regarding their ability to get funding. Now, since funding is no longer an issue, he focuses on construction material deficits as the major concern... anything to disuade the competition from getting a foothold in the neighborhood. Jaybee, that's a crazy-big development. Is condo-tel the developer's name? That is going to be one well developed corner in a few years. I-Drive area is quickly becoming the next downtown Orlando or Brickell/Biscayne area in Miami. ^I spoke with an executive from Peabody Hotel on the phone in early May and was the one that posted the news about the Peabody downsizing from the 42 story tower to a 32-33 story tower. He indicated at that time there was no need for the 1000 plus rooms and that they were looking at possibly fewer rooms (downsizing)and had a shorter tower planned that he stated would be around 32-33.
p.s. hey bic can you work your magic and put up a map of the I-drive corridor aka Downtown Orange County to show where all the projects are going to be. I have gotten lost with all the developments going in down there.